Aviation Updates Philippines - Philippine Airlines (PAL) will further boost its operations at its hubs in Davao, Cebu and Clark, with the scheduled arrival of 15 new aircraft within 2018, and another six (6) aircraft in 2019. 4-STAR AIRLINE. 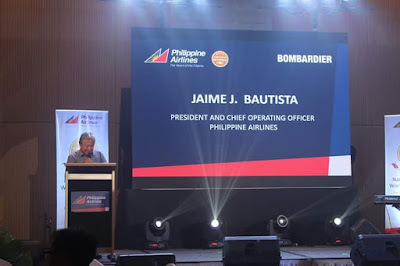 Philippine Airlines President and Chief Operating Officer Jaime J. Bautista speaks in front of media and local government officials in a gala dinner held at the Marco Polo Hotel, Davao City on Thursday. Photo by Dirk Salcedo - PPSG/AUP. The new routes to India are PAL’s response to the call of DOT Secretary Wanda Corazon Teo for a direct link to India, a potentially rich producer of future tourist visitors for the Philippines. PAL is also assessing the request of DOT Secretary Teo to launch international routes directly from Davao International Airport, possibly to Bangkok or a point in Japan. The DOT Secretary, a Davao resident, has long championed Mindanao as a prime destination for eco-tourism, adventure and cultural tourism experiences. Upgrade to widebody A330 or A340 aircraft on more selected Manila-Cebu and Manila-Davao flights. Additional frequencies between Manila and Dumaguete, Cagayan de Oro, Iloilo, Cebu, Puerto Princesa and Bacolod, starting in April/May. The additional China-Cebu and Korea-Cebu flights are intended to feed more tourism travel to Camiguin, Siargao, Coron, Bohol and likewise to Butuan, rather than exclusively to Cebu. This is one positive multiplier effect of a thriving PAL hub network centered on Cebu Mactan. PAL currently flies to 16 domestic and seven international points from Cebu, 14 domestic and one international points from Clark, six domestic points from Davao, and one international destination (Seoul, Korea) from Tagbilaran. STATIC DISPLAY. Philippine Airlines and Bombardier organized a static display of their newest Bombardier Q400 NextGen aircraft at the Davao International Airport on Thursday last week. Photo by Dirk Salcedo - PPSG/AUP. 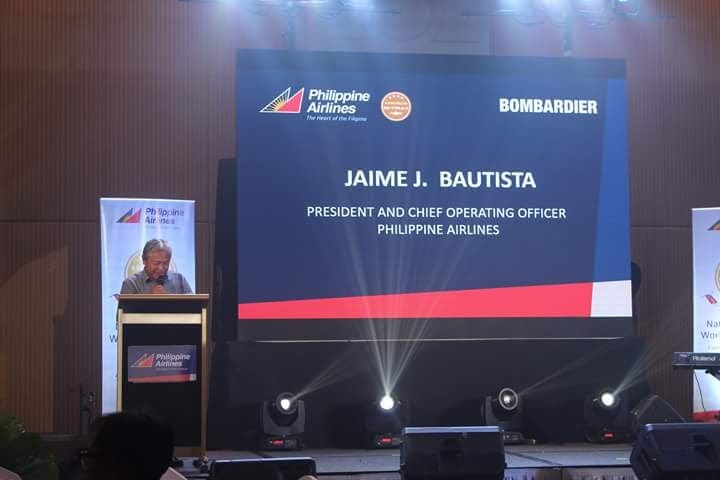 The PAL fleet buildup will continue until year 2024, providing valuable support to the airline’s ascent to the ultimate goal of 5-Star rating by Skytrax, the global airline rating organization. The Skytrax 4-Star certification was a third-party affirmation of PAL’s successful reassertion of its stature as a leading world-class airline. PAL is the country’s first and only 4-Star airline, joining 42 other carriers – such as British Airways, Emirates, KLM, Japan Airlines, Qantas, Thai, etc. – also rated 4-Star.